Of those six new vintage compressors, VCA160, TUBE176, X903, and Gyraf GYRATEC X are already available for Antelope Audio’s Orion Studio, Orion Studio Rev.2017, Zen Tour, Zen Studio+, Orion32 HD, Goliath HD, and Orion Studio HD audio interfaces (with Goliath and Orion32+ coming soon); STAY-LEVIN and ALT-436C are already available for Orion Studio, Orion Studio Rev. 2017, Zen Tour, Zen Studio+, Goliath HD, and Orion Studio HD (with Goliath, Orion32+, and Orion32 HD coming soon). All are different and desirable — just like the vintage effects units upon which they are uniquely modelled. Combining classic analogue sound with practical visual feedback and ease of use, Antelope Audio ’s VCA160 is inspired by a legendary line of VCA compressors and limiters. As a powerful dynamics processor suited to both ‘brick wall’ and also subtle peak taming, it has been carefully modelled to preserve the desirable and disparate characteristics of hard-knee and gentle low-ratio compression alike. Fast and firm, it works well with controlling vocals, bass guitar, or individual drums. When working with transient-heavy material, such as kick drums or bass, its rapid response time can create a classic thwack-type sound that is instantly recognisable from its punchy pedigree. TUBE176 is modelled on one of the best compressors ever produced as far as many industry insiders are concerned. The original hardware unit owes its unique sound to a long-since-out-of-production variable-mu dual triode tube, but now the powerful and fast compression characteristics of this classic studio dynamics processor have been brought back to life in the FPGA realm by Antelope Audio and can be applied to anything — vocals, guitar solos, bass lines, drums, and even full mixes. Thanks to its straightforward INPUT and OUPUT gain control-led interface, TUBE176 makes light work of dialling in smooth sounds or, conversely, completely flattening them to suit music material in any style. So whether boosting vocals to cut through a busy mix or allowing drum transients to shine throughout, TUBE176 takes it to the limit — albeit always with welcome vintage vibe and colourful character. X903 is based on a cult compressor famed for its unique compression characteristics. Complete with smart RMS detection and straightforward controls, compression that is intuitive and musical rests easy with X903. Hard-hitting compression tames peaks, bathing anything in analogue warmth, while the X903’s negative ratio settings allow for dynamic inversions, pulling back the transient peaks for a unique-sounding tugging type of special effect. Equally at home with making more natural-sounding compression, X903 can capably mangle dynamics to create cutting-edge sounds. Compression continues apace as Antelope Audio is the first company to model Danish developer Gyraf Audio’s hand-built hardware with Gyraf GYRATEC X. Speed is a determining factor in the original unit’s appeal, as is its highly-musical Vari-Mu compression technology — itself inspired by early limiter designs. All are authentically brought to life in digital real-time, thanks to Antelope Audio’s custom FPGA. Fantastically versatile, Gyraf GYRATEC X performs well on mixes across a wide range of genres; more moderate compression settings are subtle enough to process jazz and acoustic guitars, while dialling up the compression conjures up the Gyratec X’s signature mojo, injecting incredible life and a sense of urgency into loud rock or electronic music by imbuing it with analogue thickness and character. Compression that preserves low-end integrity is perfectly possible, thanks to smooth high-pass filtering — perfect for using alongside other compressor types and Antelope Audio’s growing library of vintage hardware-based effects. STAY-LEVIN looks as epic as its sounds, capturing the spirit of its historic hardware namesake that shaped the special sound of a slew of Sixties Stateside classics. Character and colouration abound as STAY-LEVIN lends a desirable analogue edge to contemporary productions. Production perfection can come quickly, too, thanks to a simplistic set of controls — large level (INPUT and OUPUT) knobs, a three-way RECOVERY TIME knob, and two self-explanatory switches — yield surprisingly varying compression styles suited to enhancing vocals, acoustic guitars, and synth leads, while drums and bass benefit from treatment to sound both bigger and more aggressive… all courtesy of vintage compression at its finest, recreated in the FPGA domain for real-time effects perfection. Last but not least, ALT-436C is a single-channel, variable-mu tube compressor with fixed attack attributes. Modelled after the third revision of an iconic compressor series, starting a life less complicated in the late-Fifties before being heavily modded by sound engineers, ALT-436C includes the RELEASE TIME and THRESHOLD controls that endeared it to producers in the Beatles era — extremely useful when working with bass guitars, vocals, and string instruments — as an initially inexpensive (but increasingly sought-after) unit that played its part in making music sound not so cold and sterile back in the day. Today, users of Antelope Audio ’s best-in-class audio interfaces of course can explore those sounds for themselves while more modern synth sounds can be treated equally well with ALT-436C. 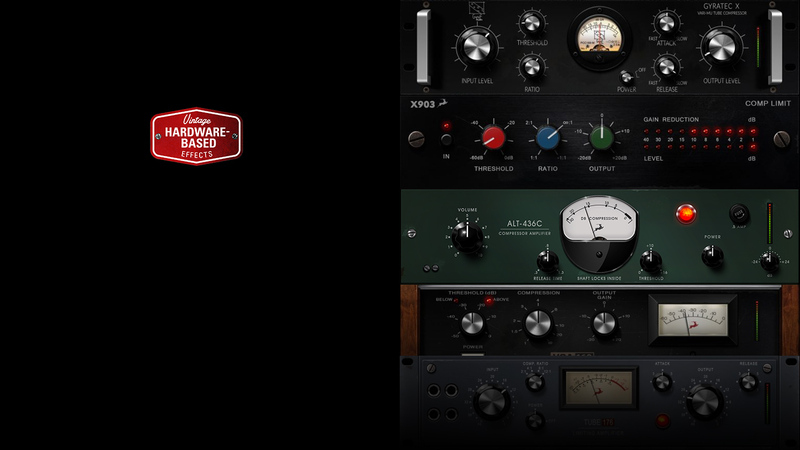 Compress to impress with these six new vintage compressors for Antelope Audio’s best-in-class audio interfaces, including powerful processing that can now support up to 32 instances of vintage compressors and 40 EQs, ever widening the scope of creativity available to their many users. Ultimately, the company is also proud to extend its EQ reach with the eagerly-awaited VEQ-55b. Based on its beloved hardware brethren, famed for production popularity throughout the trailblazing Sixties and Seventies, VEQ-55b features four disparate bands with bell curve or shelving switching and up to 12dB of cut or boost with proportional Q ranging between gently sloping at more subtle levels and a more aggressive shape at higher levels. Like all Antelope Audio’s free FPGA models, the tonal characteristics of the vintage circuitry are authentically recreated… mix and match for a self-contained compression- and EQ-enhanced mixing solution like no other! For more information about Antelope Audio’s FPGA effects, including a full library list, please visit the dedicated webpage here.